Most of us know that we should shred our personal documents. However, you might not know just how easy it is for identity thieves these days, even with strip cutting. We all have so many documents. It’s all too easy to overlook a certain kind of document that seems innocuous. This is why, to drive down identity theft, everyone should learn what to shred. So we’re going to do the public a service and list the top 5 things that everyone should shred religiously. Your social security number is as good as gold to identity thieves. This is why you should destroy any unnecessary documents containing your social security number. What if you notice that there’s a persistent source of documents containing it? In that case, it’s worthwhile to ask the provider if they can withhold your social security number from printed forms as an extra precaution. Your bills and account information won’t open as many doors as your social security number will, but a clever thief can still use them against you. It’s important to remember that any of your financial information can be used against you. This includes your utility bills and credit card bills. When thinking about what to shred, always remember that this sort of information is useful to thieves. Therefore it should be shredded religiously. Yes, even those annoying spammy credit card offers you receive in the mail must be taken out right away and shredded promptly. Why is this necessary you ask? It’s a sad fact of life that identity theft is most often perpetuated by those who know us well. This includes friends, neighbors, and even family members. Any of the above people can fill out one of these forms, claim your new credit card and then proceed to destroy your credit rating without your knowledge. It may come as a surprise to some, but thieves actually love finding expired or cancelled credit cards. Why? Well, oftentimes renewed credit cards have the same account number as the expired or cancelled card. Often times the only difference between the two cards is the expiration date. This makes stealing your new account easy. Even cancelled credit card accounts provide a way for thieves to gain access to your new account, or to open a new account under your name. As you can see, the number of ways that identity thieves can use your personal information is scary. The best way to protect your identity is to learn what to shred and then shred religiously. If you have too many things to shred on your own, our mobile paper shredding service can help. A strip cutting paper shredder is the bare minimum requirement for protecting your personal information from identity theft. Strip cutting will reduce your confidential papers into one quarter inch wide strips. But is this good enough? Is it quality shredding? To answer that question, you have to ask yourself some questions. Here are 5 questions that you should ask yourself before deciding if strip cutting is right for you. What do You Need to Destroy? Do you need to destroy sensitive documents? Or is it mostly less sensitive things like old letters or notes? To help you determine the sensitivity of your documents, ask yourself a simple question: could the contents of the documents cause you severe loss if they fell into the wrong hands? Cross Cut Shredder vs Strip? If you’re mostly destroying sensitive documents then the cross cut shredder is preferable. Cross cutting will nearly reduce your papers to dust. Strip cutting on the other hand will cut the papers into one quarter inch wide strips. With enough effort these can be reassembled. This is why, for higher security, cross cutting is superior to strip cutting. Many people decide to go with a cross cut shredder for one simple reason: it’s hard to know how your future requirements might change with time, so you might as well just get the best. Do You Have Space for a Heavy Duty Shredder? With a heavy duty strip cutting shredder you can minimize security risks. This is because a heavy duty shredder can shred as many as 15 pages at once. This isn’t just a convenient feature; it also means that it’s less likely a thief can reassemble any individual document. How Many Unique Features Do You Want? With all of the unique features available in paper shredders today, it can be hard to find the exact paper shredder that you want. You might decide to end up settling on a strip cut shredder if it has enough attractive features. For instance, there are shredders with an automatic reverse mechanism for preventing paper jams. There are also paper shredders that are meant to sit on your desk. A whole article could easily be written on this topic alone. Where Will You Buy Your Paper Shredder? How soon do you want to shred your papers? If you have the time and patience, buying your shredder online is the best option. With online shopping you’ll have the opportunity to compare different brands, features, styles and prices. With the local retail store you can find a wide selection of strip cutting and cross cutting paper shredders, sure. But, you still might not find exactly what you’re looking for. This is why buying a strip cutting shredder online is a good idea. With a strip cutter, you’ll want to know that what you’re buying will be secure (and affordable) enough. Why Is Quality Shredding Important? If you run a business then chances are that you handle a lot of confidential information from customers and clients. When this confidential information is no longer relevant, it must be disposed of properly. 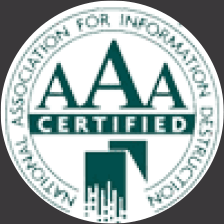 This is important for protecting your clients’ information. It’s also important for protecting your company from hefty lawsuits in case your clients’ information is misappropriated. How Do We Define Quality Shredding? Quality shredding is determined by many different factors. These factors include: shredding volume, shredding speed, security, and convenience. As you move up in the different tiers of paper shredders, these factors increase accordingly. The cross cut and confetti cut varieties provide high quality shredding and surpass the strip cut in every category except price. There are also three categories of paper shredding equipment. Each category is made for a different purpose. The different categories of shredders are: home shredders, office shredders and industrial shredders. A cross cut home shredder will provide sufficient security at a decent price for homeowners. For offices, a confetti cut office shredder will provide the best security for clients. For large companies and corporations, an industrial shredder (which is rather large) is the most efficient option. Quality shredding isn’t just defined by the speed and cut; it’s also defined by convenience. Some of the most convenient paper shredders available are handheld shredders and desktop shredders. The handheld shredder is light and easy to use. The only caveat is not all handheld shredders can shred A4 size papers. However, you can get around this issue by folding or tearing the paper before inserting it into the shredding tray. The handheld shredder is useful for shredding small papers like receipts. To sum it up: handheld shredders are useful, convenient, and cheap, so they probably deserve a place in most households. Most businesses don’t have time to shred papers, so they let the junior employees handle it. This can be a bad idea for many reasons. The employee could be overworked already. He could misplace documents, leading to information falling into the wrong hands. This is why, for the best quality shredding, one should hire a document shredding company. Our company shreds documents quickly and effectively. And in terms of convenience, you can’t beat onsite document shredding. After the shredding is completed we’ll provide you with a certificate of destruction. The certificate is proof that we shoulder the responsibility for the destroyed documents. In this day and age, we all know we need to shred our old useless papers for the sake of security. This is the reason why a large variety of paper shredding equipment has cropped up to suit different requirements. So what kind of paper shredding equipment do you need? There are three main uses with paper shredding equipment: home, office, and industrial. This kind of paper shredding equipment is a necessity for everyone. We all have too many documents lying around the house. It can be tempting to just toss them in the trash. However, shredding them is always the better idea. Now you may be tempted to go with the cheapest paper shredding equipment, which is the strip cutter. However, we usually advise against it. This type of paper shredder is notorious for being messy, getting jammed up, and taking up a lot of space with the shredded paper strips. Strip cutters are also a higher security risk. The resulting paper strips can be reassembled fairly easily. Thankfully there’s a better option: the cross cut shredder, aka the confetti shredder. This shredder is so named because the resulting papers are small as confetti. The smaller pieces results in less space being used and fewer paper jams. So what exactly is the difference between office paper shredding equipment and home paper shredding equipment? The main difference is an office shredder usually shreds faster and is larger than the home variety. Many office shredders also have thermal protected motors so they won’t burn out from high volume shredding. The best place to start looking for an office shredder is online. There are many different varieties of office shredders, so doing some online research is a good idea. Check store reviews and do price comparisons of the best paper shredding equipment for offices. Watching an industrial paper shredder go to work is one of the things in life that should be on every person’s bucket list. The sheer power of an industrial shredder is breathtaking. The volume and variety of materials that can be shredded are unmatched by any home or office paper shredding equipment available. Industrial shredders are typically used by large corporations and big businesses. They don’t require constant supervision for paper jams or other errors. Shredding is done quickly and efficiently. More than 650 pages can be shredded at a single time. Industrial shredders are big, so they can handle huge stacks of paper all at once. Many of them come with a dust extracting system. This makes the machine run smoother without the need for to clean it yourself. Now that you know the different kinds of paper shredding equipment, choosing the right one should be pretty straightforward. Contact us if you have any questions or if you would like to schedule a visit for onsite document shredding services. On-site shredding is a shredding company’s premium service. Off-site shredding on the other hand, is considered the less secure alternative for a document disposal company. With our on-site shredding service, we’ll go to your business or residence and shred your confidential materials right in front of your eyes. There are many reasons why on-site shredding will save you money. The math alone supports it. Using an on-site shredding service will cost less than your employee’s wages. The other reasons why on-site shredding will save you money follow the same kind of logic. Most large companies are very aware of cyber threats. However, one threat often overlooked, is old fashioned dumpster diving. Most people don’t know it’s usually much easier to hack into a company without even going online first. That’s because too many companies let sensitive documents get thrown into the trash. And even if management is smart enough to know better, junior level employees might not know any better, or they might make careless mistakes. Do you keep sensitive documents sitting out overnight? Do you keep your file cabinets locked? Do you keep documents that are meant to be shredded in a recycle bin? Most companies keep a treasure trove of information easily accessible every night. Remember, once these documents are in the dumpster, they’re considered to be public property by the Supreme Court. Not only will your documents become public property if thrown into the dumpster, but your business will also be breaking the law. This is because of the Fair and Accurate Credit Transaction Act (FACTA). In fact, some government officials have made it their mission to punish businesses violating this act. For example, previous Texas attorney general Greg Abbot made it his personal crusade to fine companies millions of dollars for this practice. Finally, convenience is considered a contributing factor. An on-site shredding service will help protect your interests and keep your business running more smoothly. In fact, the very name mobile paper shredding service conjures up the idea of convenience. So how will the on-site shredding work? The procedure is very simple. Our mobile shredding truck will go directly to your business or residence. This will also save you the trouble of finding space to put your own industrial shredder. Don’t worry about how long the shredding will take. Our shredders can shred up to 7,500 pounds an hour. That’s more than 225 file boxes, or 550,000 sheets. Are you ready to schedule on site shredding? Feel free to give us a call. 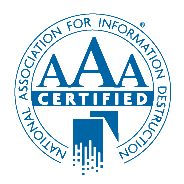 IntelliShred has been awarded the highest security rating, “AAA Certified” by the National Association for Information Destruction (NAID).